This week the theme at Take a Word is MOON. This is a photo of mine, edited with my own filters and the gorgeous face of Mary by Botticelli. I'm glad to be around here again. It's so good to see you back at the challenges, Chris. It's been a year since your last post in February 2017! 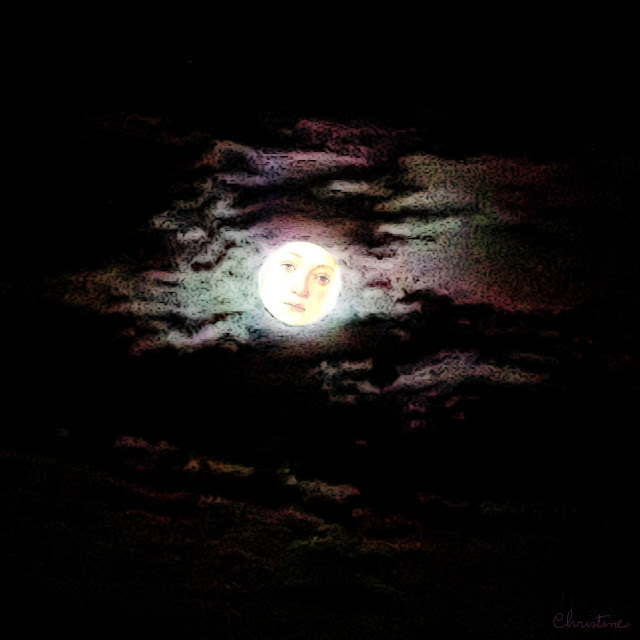 Your beautiful moon with a Botticelli face is exquisite. Wonderful artwork as always. Wow, this is a fantastic atmospheric page. Chris it's so good to see you back I have missed you. This is so beautiful peaceful and a little sad... I love it. Very creative and yes beautiful and so glad to see you back as well. And we're glad to have you around again. I've missed you! This is a beautiful bit of moon art. Great work! So good to see you back, Chris, we've missed you and your wondrous artwork.